The Arched | FPX 33 Elite Flush Wood Plus Insert delivers incredible design and extraordinary heating ability. This Fireplace Extraordinaire can heat up to 2,000 square foot space with less wood and extended burn times. The unit’s flush-to-the fireplace design compliments the fine lines and delivers great heating efficiency. With the help of a unique air wash system, the unit’s grand single door remains clean. Perfect for displaying the glowing fire! 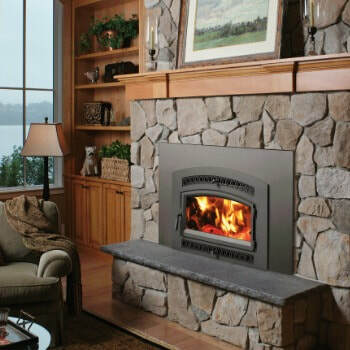 The 33 Elite is crafted to be used in zero clearance or masonry and wood fireplaces. The 33 features an adjustable speed blower. Also, consider adding the GreenStart Option to experience a new ignition system. Simply load your wood and push the button! No slow startups here!